One of the reasons I so enjoy the unlisted markets is the opportunity to discover and examine some truly odd and unconventional stocks. Where else in the public markets can one invest in a massive and secretive agricultural empire (J.G. Boswell Co. BWEL), a minor league baseball team (Rochester Community Baseball Inc. RCCB) or even extensive real estate, timber, energy and mineral assets in Michigan or Tennessee (Keweenaw Land Association, Ltd. KEWL and Coal Creek Company CCRK)? It’s tough to get bored. ACMAT Corporation qualifies as one of these eccentric companies. ACMAT is a national provider of surety bonds for the construction industry. Surety bonds are purchased by builders and contractors by necessity. These bonds are sold by insurers, who agree to pay damages in the event that a contractor fails to complete a contract to the agreed specifications or otherwise fails to perform. After all, nobody wants to award a contract to a construction firm without having recourse should that construction firm go bankrupt with the building halfway complete. Which is why things like the CSCS Mock Tests by Construction Skills Test exists, which everyone involved, in the end is glad for. ACMAT specializes in providing bonding for non-standard contractors who otherwise would have difficulty securing coverage from conventional surety bond underwriters. That may sound risky, but the truth is that ACMAT is an exceptionally conservative underwriter. In 2012, ACMAT’s loss ratio on premiums was only 10%, and 11% in 2011. That kind of underwriting would be a recipe for amazing profits, but the company uses only a scant percentage of its total underwriting capacity. In the 2012 annual report, the company noted that it could increase premiums more than 20 fold before breaching NAIC guidelines. Due to its conservatism and history of profitable underwriting, A.M. Best rates the company at “A” or excellent. ACMAT is an insurer that scarcely bothers to insure. In fact, premiums written have declined 85% from a high of $15.7 million in 2004. The company expresses a willingness to increase its activity once the construction market picks up, but it is unlikely that any increase will approach previous levels of underwriting activity. ACMAT’s current asset base is 47% lower than it was in 2004, and its equity is 25% lower. As conservative and limited in scope as ACMAT’s insurance operations are, the company could hardly be more aggressive when it comes to returning capital to shareholders. ACMAT is a voracious purchaser of its own shares. ACMAT’s formal share repurchase operation was begun in the 1980s, and the company has had a laser focus on reducing its share count ever since. Since 1994, the company has reduced its shares outstanding by a whopping 73%, hoovering up an average of 6.7% of shares outstanding each year. Since 2009, the pace has accelerated to 8.3% per year. A yearly chart of shares outstanding and book value per share is presented below. From 1994 to the present, ACMAT spent a little more than $77 million on net share repurchases, a figure that is more than four times the company’s current market cap. The repurchases were done at an average price-to-book ratio of 1.05. At this point, I’d love to talk about how ACMAT’s share repurchases were some Templetonesque example of superior capital allocation policy and how shareholders have enjoyed high teens level returns for decades on end. Unfortunately, I can’t, because ACMAT’s returns have been awful, and that’s putting it gently. Since the end of 1994, shareholders have seen their investment in ACMAT’s class A stock rise by…..151%. Over the same period, the S&P 500 (in terms of SPY) returned 481%. Even the Barclays Aggregate Bond Index returned around 221%. There’s no excusing such a poor long-term performance. ACMAT’s return on equity has consistently failed to match its cost, costing shareholders millions. It goes to show that for as much as value investors love to trumpet the benefits of share repurchases, they aren’t magical. Satisfactory long-term returns require a comprehensibly sensible capital allocation policy that strives to earn an acceptable return on equity. ACMAT shareholders would have been much better off if the company simply liquidated in 1994, rather than spending the next two decades earning anemic returns on equity. Even today a liquidation would be very beneficial. Company shares trade at a large discount to book value and the company seems unlikely to earn an attractive return on equity any time soon. But of course, that will never happen due to ACMAT’s thoroughly entrenched insiders. CEO Henry W. Nozko and his wife Victoria C. Nozko together own a majority of shares outstanding and control nearly all of the voting power. The last available compensation data for Mr. Nozko is from 2003, where he earned a salary and bonus of $732,000. This may not seem like much, but it equaled fully 29% of ACMAT’s pre-tax income for the year. The company’s top three officers earned an amount equal to 62.5% of ACMAT’s pre-tax income for the year. This data is old, but I see little reason why anything would have changed in the last decade, especially now that the Nozkos control even more of the company’s shares through the continued repurchases. Company management also seems prone to vanity projects, including the construction of a brand new headquarters at a cost of $4.3 million in 2012. That brings me to the second point of this post: management matters. And it matters especially with insider-controlled micro-cap companies, where the major institutions and activists that keep large company management teams nominally in check are absent. Management teams at large companies can and frequently do make bad capital allocation decisions, overpay themselves and pursue vanity projects. But if they do it for long enough, they are typically challenged and either chastened or removed altogether. There is rarely such a check on the tiny and obscure companies that populate the world I play in, and that makes management evaluation all the more important. Some like to talk to management directly and ask questions about strategy, assess ethics, etc. That works for them, but I reason that shoddy or dishonest managers are pros at knowing what investors want to hear and saying exactly that. I’d rather look at what they do. Managers prove themselves to me by aligning their interests with shareholders, then showcasing their skill and trustworthiness by creating track records of efficient operations, astute capital allocation decisions and reasonable compensation. Perhaps if ACMAT’s management team gets serious about improving returns on equity and equally serious about reducing its cost structure, ACMAT will be an attractive investment. But for now, it’s just another unlisted oddity. Alluvial Capital Managment, LLC does not hold shares of ACMAT, Inc. for client accounts. Firstly thanks for sharing your investment thoughts with this blog. I read it religiously, and have become a better investor because of it.. so thank you. I thought I would add some thoughts on ACMAT. I would completely agree with you that the historical ROE is terrible. However I think we should note that the historical ROE is made up of two business. One terrible, the construction business, and one great, the contract and commercial surety business, so I think we need to be careful using combined ROE of the two business to made a conclusion. The family’s historical business was construction and it seems the founder’s son really tried his best to give it a go at it after his father passed away in 2002, but finally gave up on the business in 2009. It must have been difficult to let go, but going forward we should only analysis and project the economics of the surety business. Given the massive buybacks (which I agree are not a godsend to every situation) the potential income stream from the surety business is getting pretty interesting. Currently one can buy shares about an 5% ROE yield. That’s not great. However if one understands where we are in the surety cycle, as well as cross references this with historical numbers produces by the surety devision, then its pretty easy for the company to generate about a 20% ROE yield in a better market (if interested a few sources can be provided for figures mentioned here). Another interesting figure here is that over 8 million bucks is held at the holding company level and not necessarily to generate the ROE yields mentioned above. Excluding this excess cash gives one a yield of about 7.5-30% ROE (Of course they could continue to hold onto the cash forever but its there and you as an fractional owner own a portion of it, and if does effect the price someone would be willing to pay for the business if they ever decided to sell). From another angle ACMATs TBV is about 31, but this is heavily padded but probably more like 35 a share. This information is from discussions with a few surety industry professionals. Think about it, if I’m an owner/operator why would I want to show more profit than I absolutely have to? Maximizing pre-tax income is the mark of the agent operator, but if you own the place and know the money’s there, why recognize it before I absolutely HAVE to. I would agree that executive comp is probably too high, but it impossible to see current comp. Also I would say that they could definitely do more and better allocations with the float (maybe something OTC Advantages and Catalpa Capital could help with 🙂 ). P.S. I have conversation notes and NAIC documents for backing up some of the figure above if anybodies interested. Always enjoy your thoughts and comments. 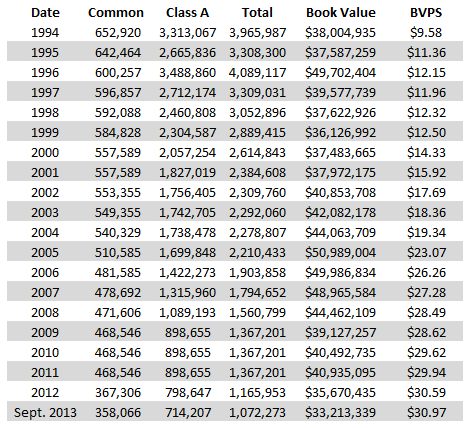 I do agree that ACMAT’s book value is very much under-stated. The company has always been extremely conservative in its reserving. The holding company is over-capitalized and the surety insurance cycle is likely turning. Yet, I have difficulty in seeing how ACMAT’s profits could approach their previous highs, and how shareholders would benefit. Profits – ACMAT’s earnings hit a recent peak in 2006, with a return on average assets of 3.78%. And that was when the 10 year treasury was at over 4%, compared to 2.7% as I write. Since then, the company has shrunk its balance sheet by 38.3%. Even if we assume ACMAT could once again earn an ROA of 3.78% through lower interest expense and better efficiency, that would mean an EPS of $2.81. That’s a good earnings yield on the current stock price, but that represents peak ROA achieved at the top of the construction cycle, not a cyclical average return. Sure, ACMAT could lever up its balance sheet, which is stronger than it was in 2006, but the long-term trend is toward a smaller and smaller company, and I think management would really have to be convinced of an extended period of strong construction activity to reverse that trend. Assets – ACMAT’s current earnings and my projected earnings both look much better than viewed in the light of the excess capital that ACMAT carries, but I have my doubts that minority shareholders will ever see the benefits of that excess capital. Management has absolutely no incentive to dividend any of it out, because they rationally would prefer to avoid paying unnecessary taxes. In my view, management is likely to continue its share repurchase program until there are simply no material outside shareholders left, at which point a buyout offer or reverse split would mop up the remaining shares not owned by management. The company could probably argue that a price of 1.0x book value is fair, based on the company’s small size, poor profitability and awful liquidity. Basically, ACMAT has not done right by minority shareholders for decades and I can’t see what would persuade them to begin doing so now. There’s also the opportunity cost to consider. Sure, maybe ACMAT is bought out at 2.0x book ten years from now, but in the meantime I could have invested in any number of companies that currently offer double-digit free cash flow yields, have good growth prospects and treat shareholders as partners. But again, I always appreciate a different perspective. I don’t own any ACMAT, but if you do I hope you do very well! Thanks so much for the heads up on AWILCO last year, that was a nice one for me. I just started looking at BFCF. The seeking alpha article values the Bluegreen equity at about $950 million. BBX purchased Bluegreen at a valuation of about $315 million in 2012 or 2013. How did the value triple in under 2 years? Am I missing something? Great article as always. Do you have any information on RCCB? Also, I’ve been looking into BABB. There are earning ~$4k (5% royalty) per franchised store and signed an agreement to have 30 stores franchised (over seas at 3%). Could turn into an additional $100k in revenue over 3 years with excellent margins on additional $1 in revenue. Not much to get excited about lately for both exchange listed and the pinks. On the other hand, it’s fun to say you’re a part owner of a professional sports team! I’ve looked into BABB before and passed, but franchising is a nice business with great margins. I’ll take another look. It seems like you have dug up some very interesting companies. My question is, how do you go about finding them?